KATMANDU: Nepal is considering banning foreign climbers from scaling Mount Everest alone in a bid to reduce accidents on the world’s highest peak, an industry official said Thursday. Solo climbers would be forced to take a local guide up the mountain amid concerns of safety, overcrowding and piles of rubbish on the “roof of the world,” the president of the Nepal Mountaineering Association said. The proposed ban is likely to anger elite solo mountaineers, who enjoy the challenge of climbing alone, even eschewing bottled oxygen, and who blame a huge influx of commercial expeditions for littering the peak. The proposal is one of a string of measures being flagged ahead of the start of the climbing season in late April, and comes 12 months after a brawl on the mountain between three European climbers and local guides. 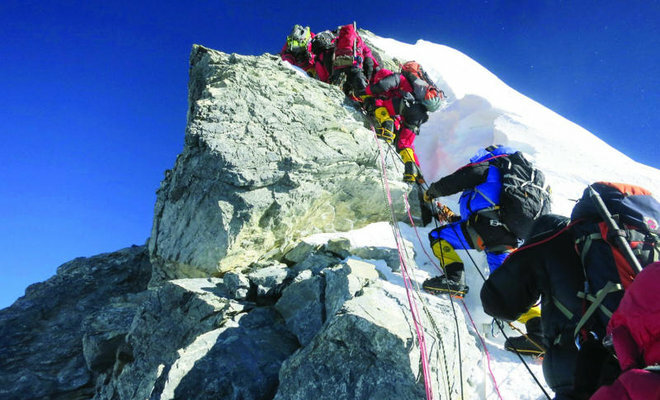 “We are considering making it compulsory for individual foreign climbers to take along a local guide when they go to Everest, to reduce risks and prevent accidents,” said Ang Tshering Sherpa, whose association represents tourism promoters. “Most of the accidents that take place on Everest involve mountaineers from abroad who don’t use local guides,” Sherpa told AFP.<br>Sherpa said the guides would also help climbers carry down garbage in line with new rules requiring each mountaineer to bring back eight kilo of rubbish from the mountain. “Individual climbers are exhausted by the time they make it up there, they have no energy left to bring down garbage and end up adding to the rubbish on Everest,” he said. Government officials and tourism promoters will discuss the proposal at a meeting with representatives from India, China and Pakistan next month in Kathmandu, he said. Last year’s brawl shocked the mountaineering community and fueled worry that overcrowding on Everest was raising tensions and leading to dangerous standoffs. The fight erupted when the Nepalese guides asked the mountaineers to wait while they fixed ropes on an ice wall for other climbers. The Europeans refused, saying they were free to ascend since they did not need to use the ropes, sparking a violent argument. The government has since announced plans to double the number of climbing ropes on congested and dangerous ice walls near the summit to reduce cut traffic and prevent arguments. Authorities have also decided to station soldiers and police at Everest base camp so climbers can approach officers in case of any trouble.